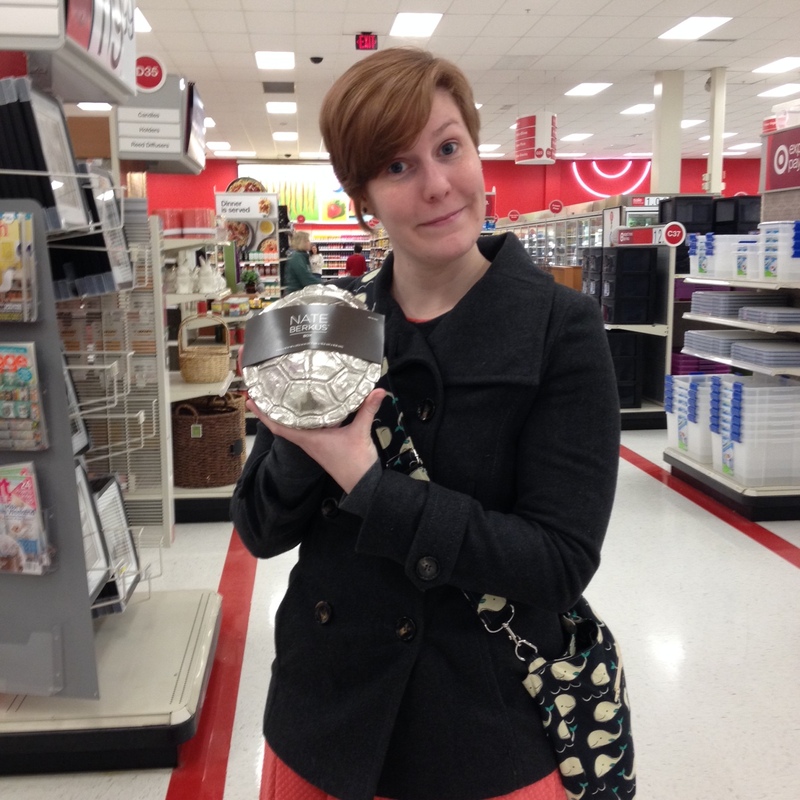 Generally when I shop, I’m a neat and conscientious shopper. If I change my mind, I like to put the item back where I got it or wait until I get to the register and hand it to the cashier. I don’t disrupt displays and sometimes I’ve been known to block shelves while I browse (for you non-retail workers out there, that’s where you pull all the things forward to make it look neat). 1) Touch everything. 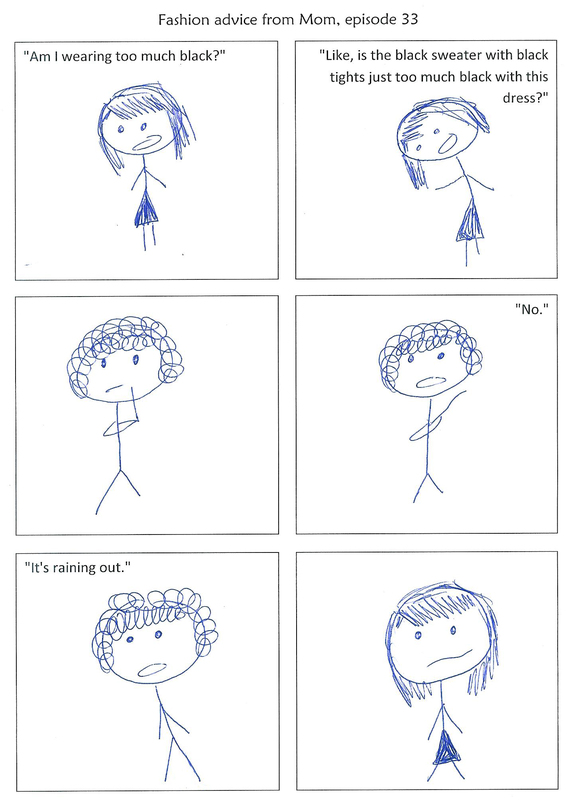 I do this anyway, but it’s more fun with my friend. How do you know what something feels like if you don’t touch it? How do you compare textures? It’s totally ok to rub things on your face. Or each other’s faces. And while almost every one else shirks away, she is always ready to have her nose pinched with tongs or grabbers. 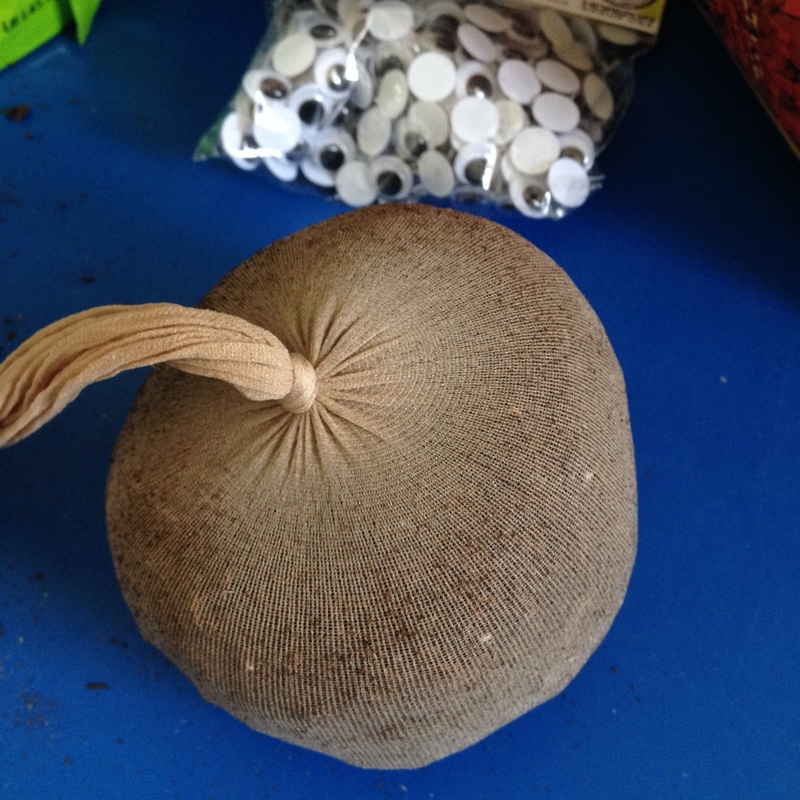 2) Displays should also convey the use of an item. 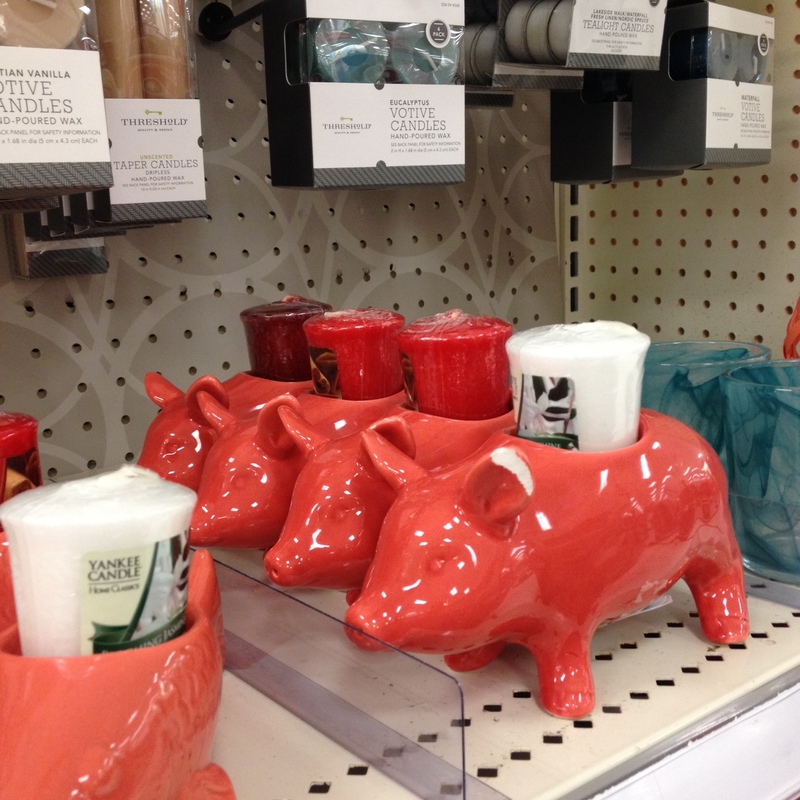 How can you possibly imagine what these pig candle holders are for if they aren’t holding candles? My friend sang “everybody gets a candle!” as she gave everyone a candle. She does a lot of singing. 3) Also, all candles are for smelling. Especially the gross ones. Then have your friend smell it. Then talk about how gross it is! 4) Take pictures with everything you love. 5) Giant letters are for making giant words. 6) Everything needs a pattern. If it doesn’t have one, feel free to give it one. 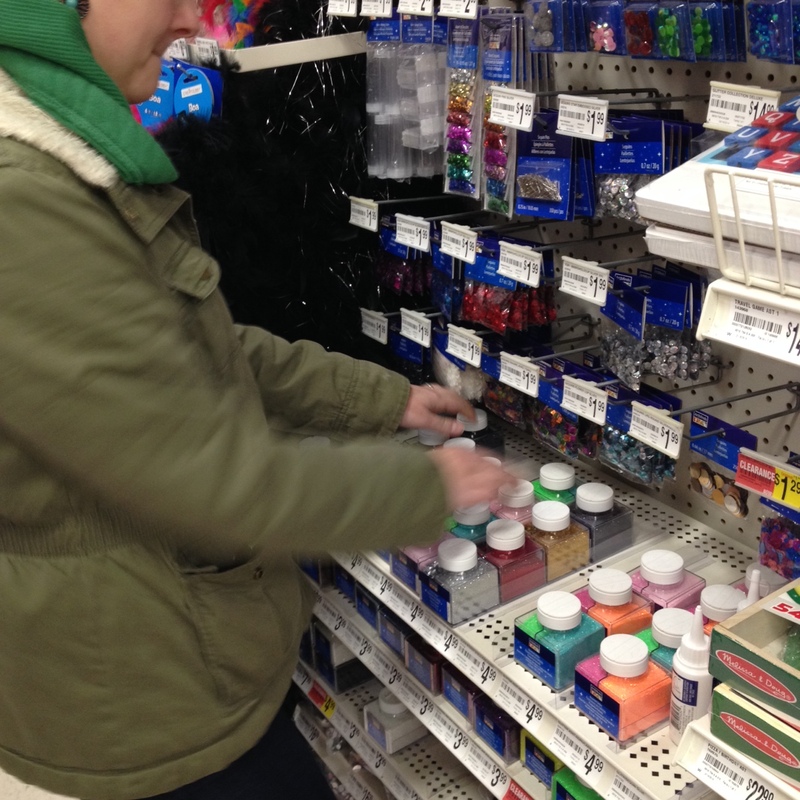 7) All glitter is for touching. Even if you hate glitter (like I do!). Find it. Touch it. Share it. 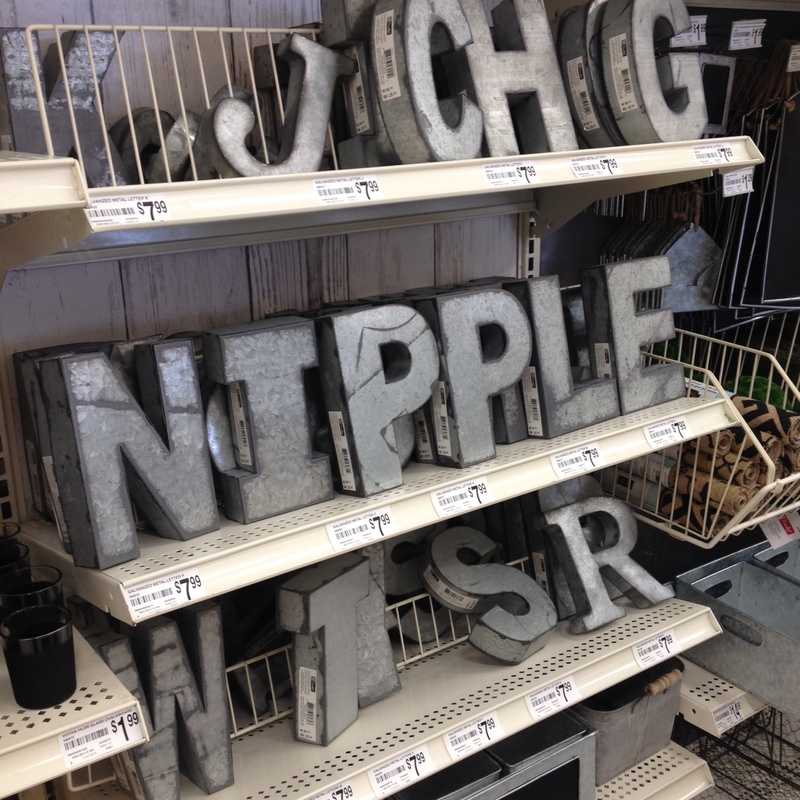 What are some things you do when you’re out shopping? Easter is right around the corner, and if you’re anything like me you probably 1) haven’t decorated your house yet because 2) you have no decorations. Here are some easy projects you can do to make your home festive without breaking the bank. Plus, crafty! DIY pom pom bunnies can hide on shelves or in corners and brighten a room without overwhelming it. These herb-stenciled eggs are a great idea. Think about other materials you can use for the stenciling! Bunny pillows! Super cute and so friendly. I think I would make one on the larger side and keep it as a permanent couch buddy. Entertaining children this year? After the egg hunt is over, have them decorate their own Egg Puppets like these ones from Oriental Trading. I’m not saying you should buy these, but I’m also not saying you should find a similar picture on the Internet and print it on card stock (which is way less expensive). 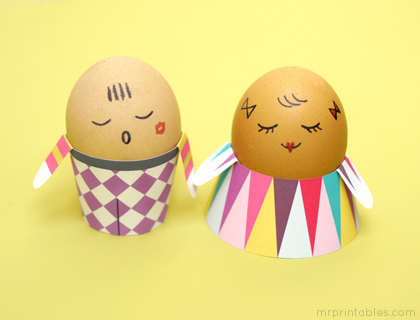 These egg people are super cute and a lot neater than traditional egg coloring. I would personally skip their little outfits and leave them in the egg carton. Why? To surprise anyone reaching for an egg, of course! 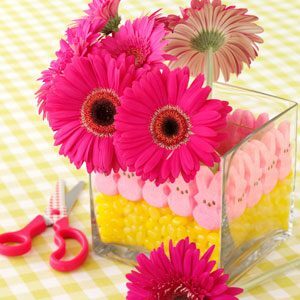 Decorate your table with this simple Peeps-inspired centerpiece. I might replace the flowers with a candle but I’m not sure of the Peeps would puff up. Come across any other cute Easter decorating ideas? Let me know in the comments section! This is one of my ALL TIME favorite projects! It’s super easy and fun for all ages. 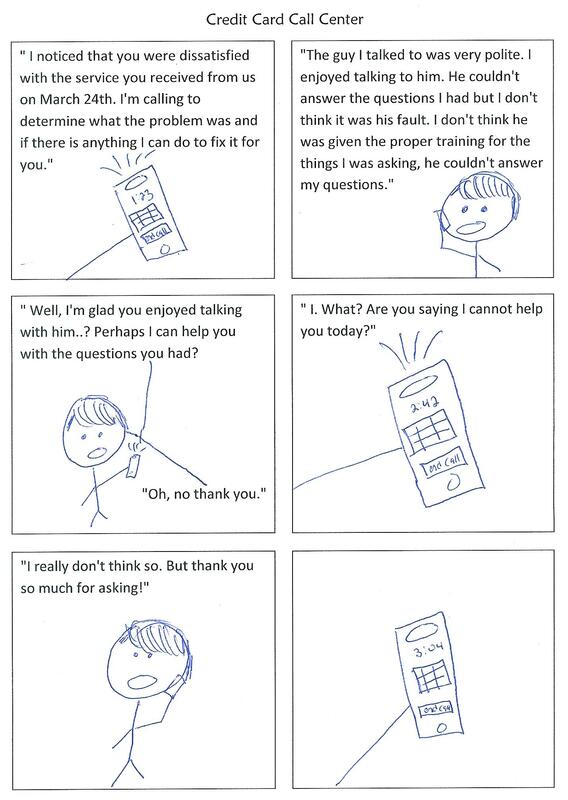 Are you a teacher? Make them in class! Are you an RA? Make them for a program! 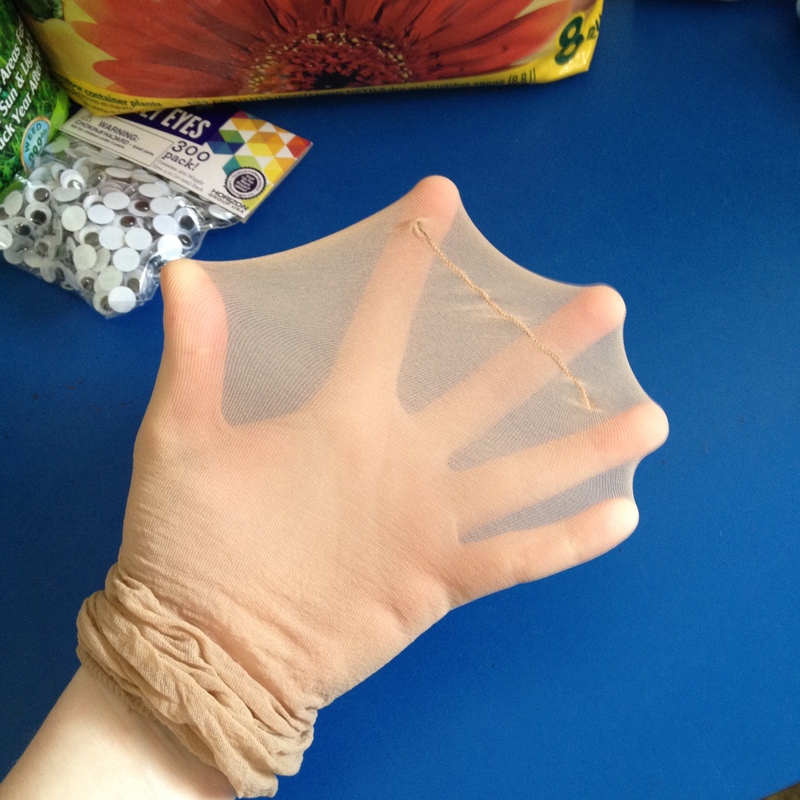 1) If your nylon is part of a tights set, cut off one leg to use. If it’s a knee high, just grab one. You don’t have to worry about it being too long right now because you can bunch up the excess to get to the toe of it. 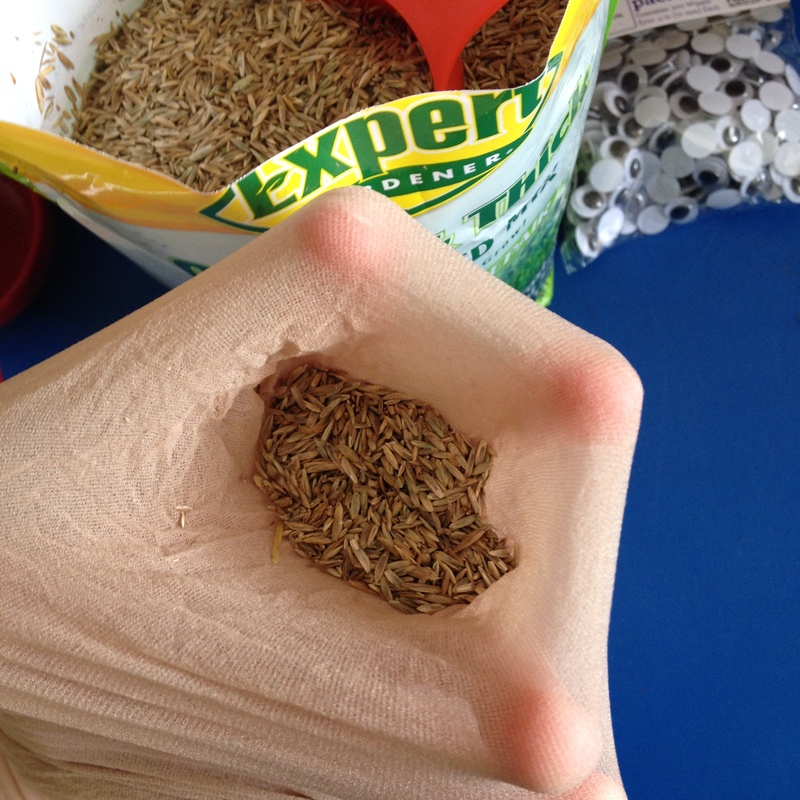 2) Sprinkle some grass seeds in bottom. I used about a tablespoon. 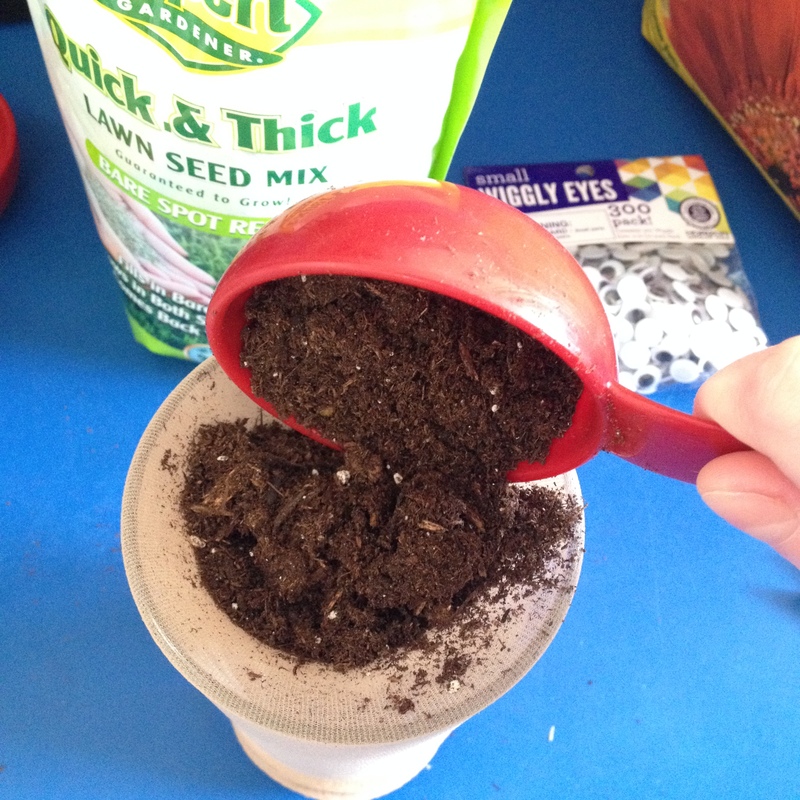 3) Fill it with dirt. I found that sticking the toe inside a beer glass and puling the excess around the glass helped hold it open while I poured in the dirt. Doing the project with a friend is also helpful, because they an hold it open for you. Find what works best for you! 4) Shape it! Do you want a cone head or something close to a tennis ball? 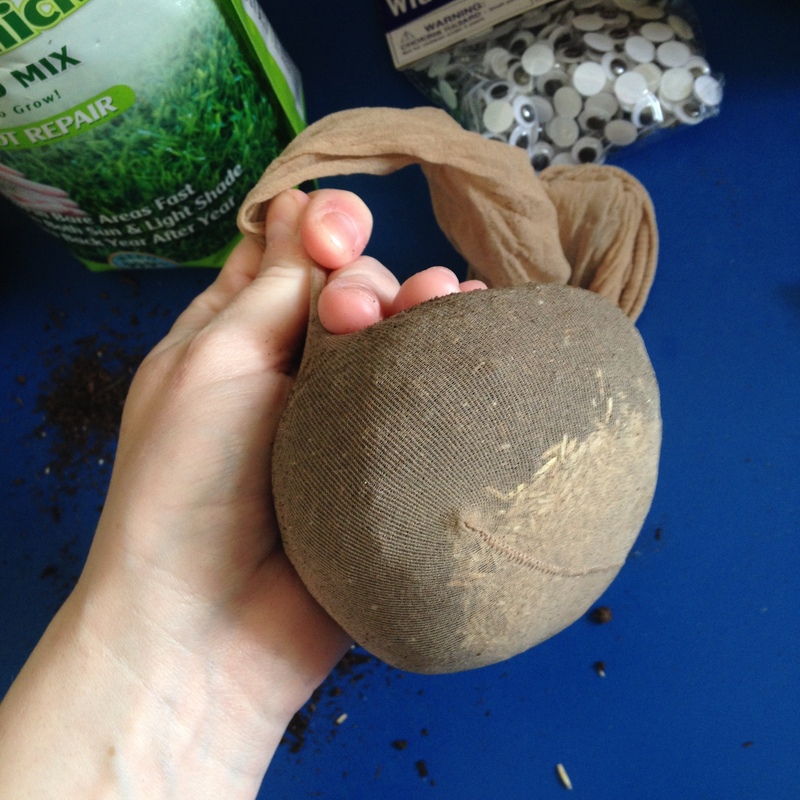 5) Pull the nylon as tight as you can around the dirt and tie off the end. 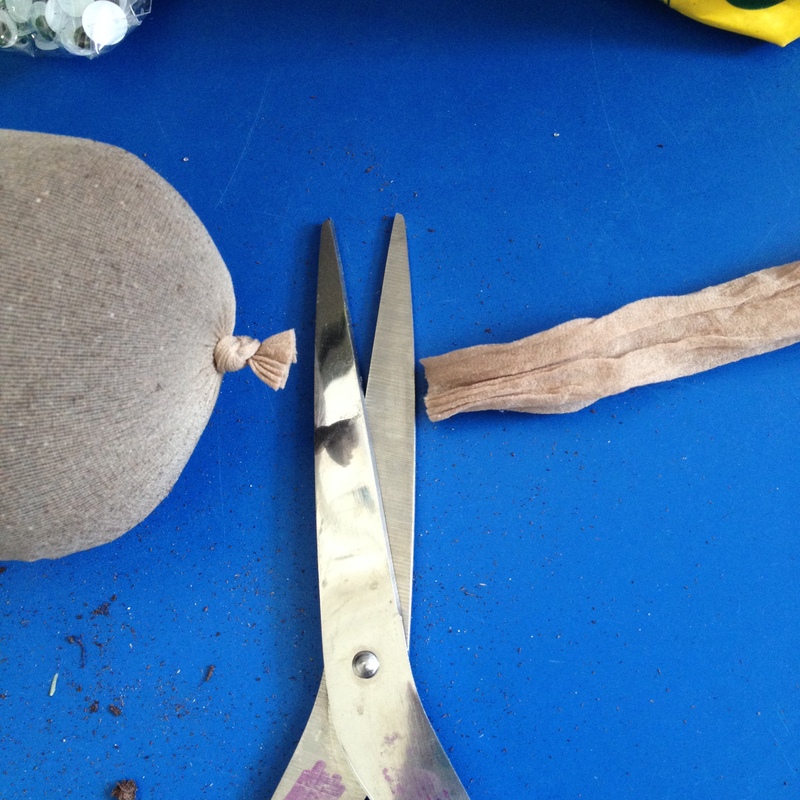 And snip the extra. This part will be on the bottom of the head, and once it’s resting in a bowl you won’t be able to see it. 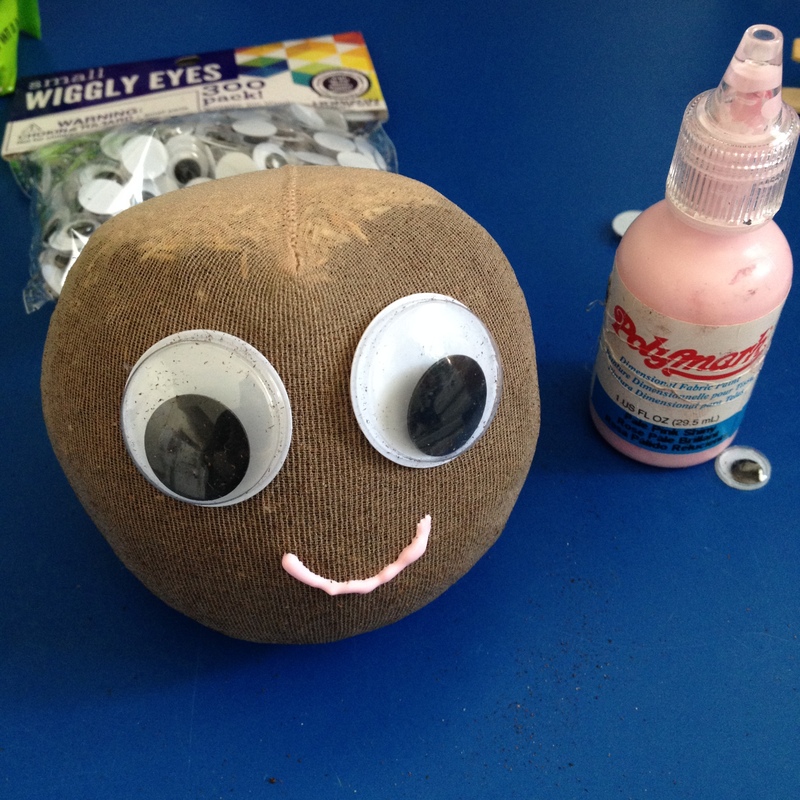 6) Use hot glue to attach the eyes. 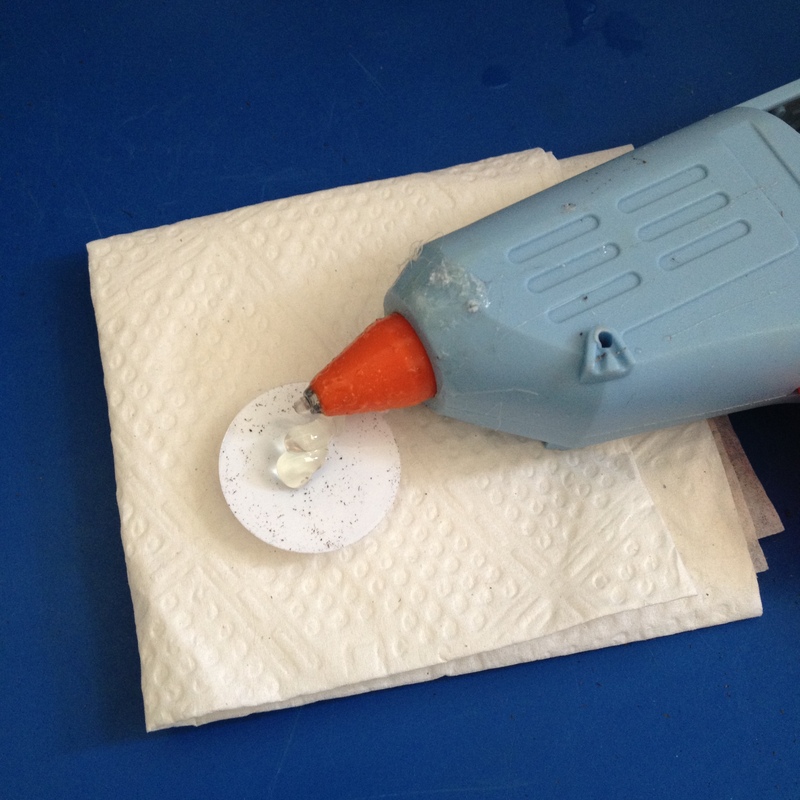 Hot glue is ideal because it doesn’t take long to dry and it water resistant. 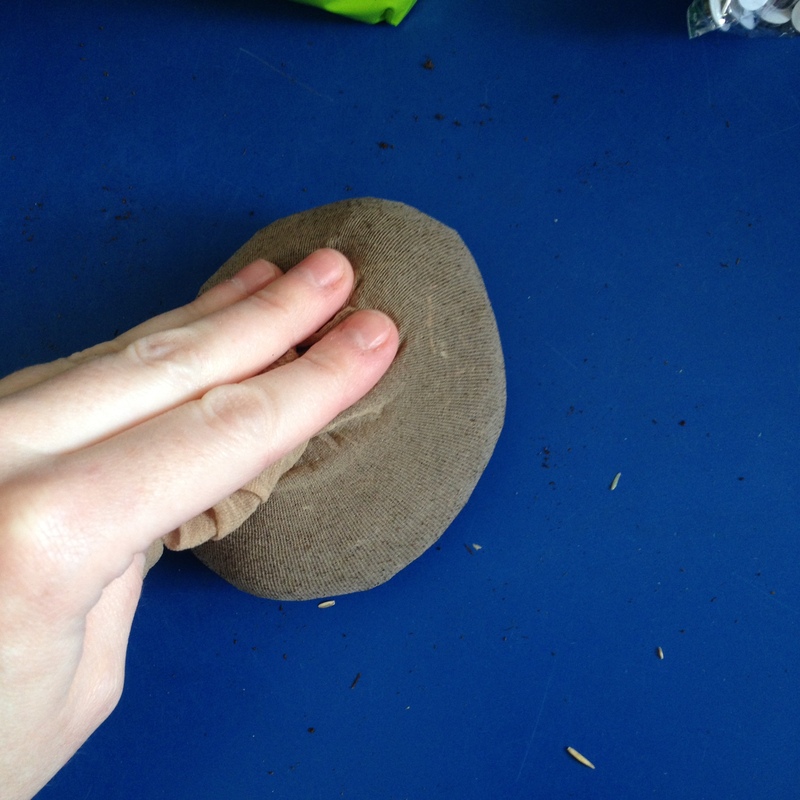 7) Use your puff paint to give it a mouth. 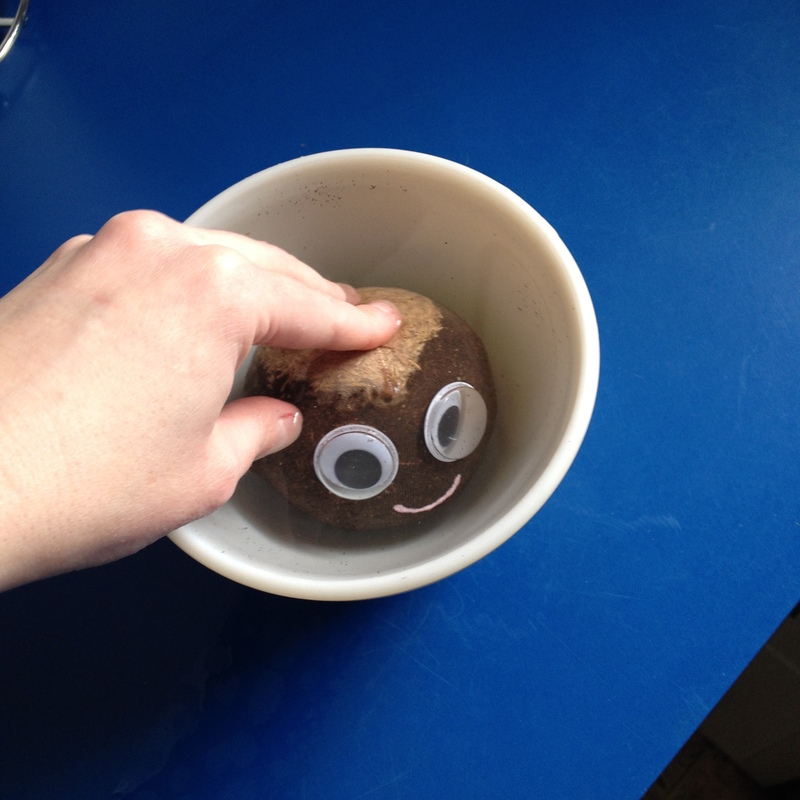 8) After the mouth has dried, soak the head in water for a few minutes. It might try to float to the top, so hold it under. 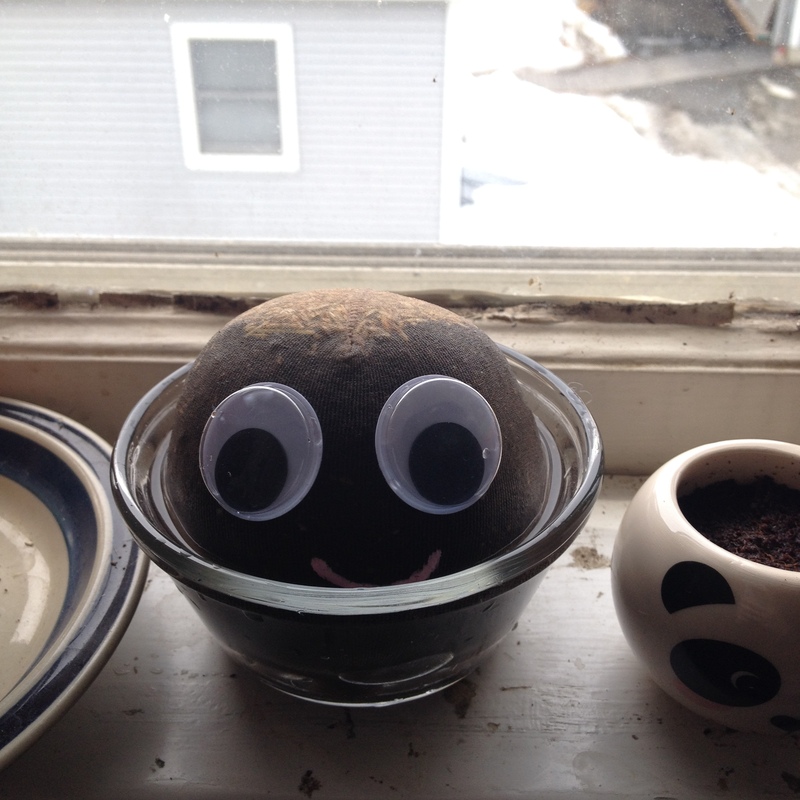 9) Place your new friend in a sunny area and keep the soil moist. 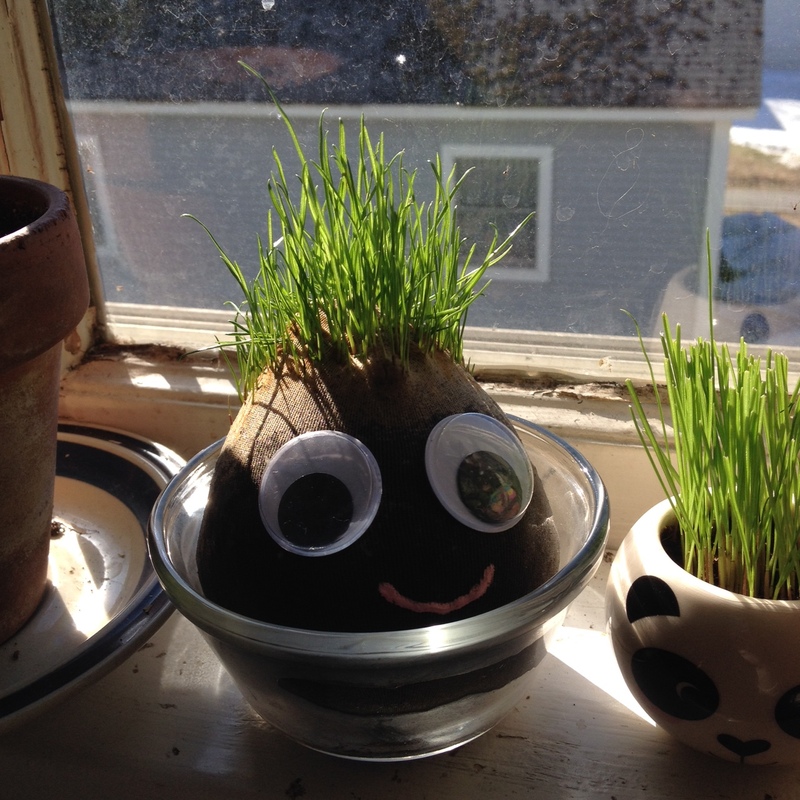 It took about a week and a half for mine to sprout, but now his hair is growing like a weed! These are so fun because they are so easy to personalize. Give it different sized eyes, freckles, a crazy mouth, a beard; the creative possibilities are nearly endless! I hope this was easy to follow. If you have any questions, feel free to message me! And if you decide to make some of your own, please share them with me! That’s right! 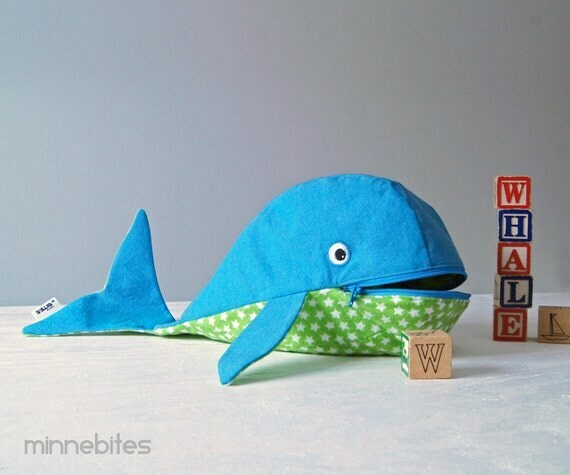 This week we’ll be looking at some amazing creations NOT JUST because they are whale-shaped- but because they have intricate details that make them super awesome. 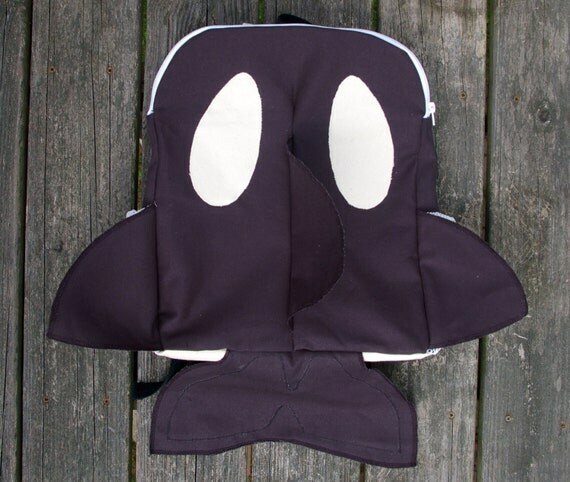 Take this Orca Bag for example. It could have been just a regular and boring back pack. NOPE! IT’S AN ORCA! 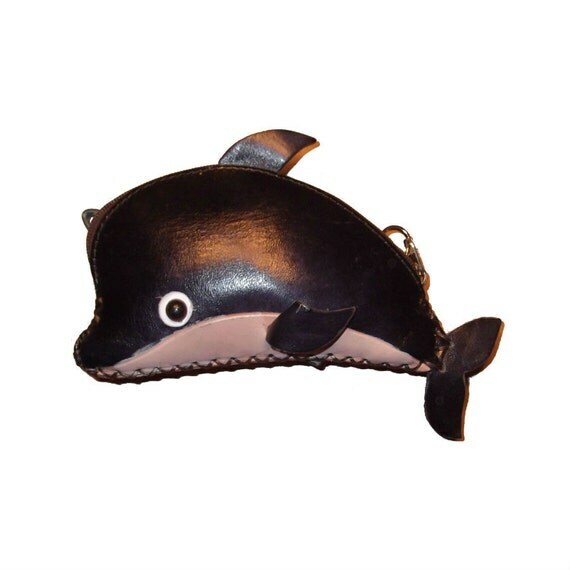 I normally shy away from leather but this little guy is too cute to pass up. And I saved my favorite for last! Think of the things you could stash in that mouth! I grew up in a beach town so I sort of consider myself a beach babe. Not because I think I look tight hanging around on the shore in a swim suite in the height of summer, but because I grew up near the water and am drawn to it. The smell of the sea air, the feeling of salt water drying on my skin. At 27, I still enjoy playing in the waves and exploring the shore. But let me tell you, one beach babe to another, the best time to explore is in the winter. I think beach babe qualification also include a year-round love of the beach, not just in the summer when the sun is bright and warm. My favorite beach time is off-season. Only a few other explorers and no tourists to be seen. This was my first winter away from the ocean and I felt it. Winter is hard for me anyway; less sunlight, too cold to even want to go outside, and I’m more reclusive than in the summer. But knowing that to get to a beach I would have to travel 3+ hours? Brutal! How could I too for winter critter prints? 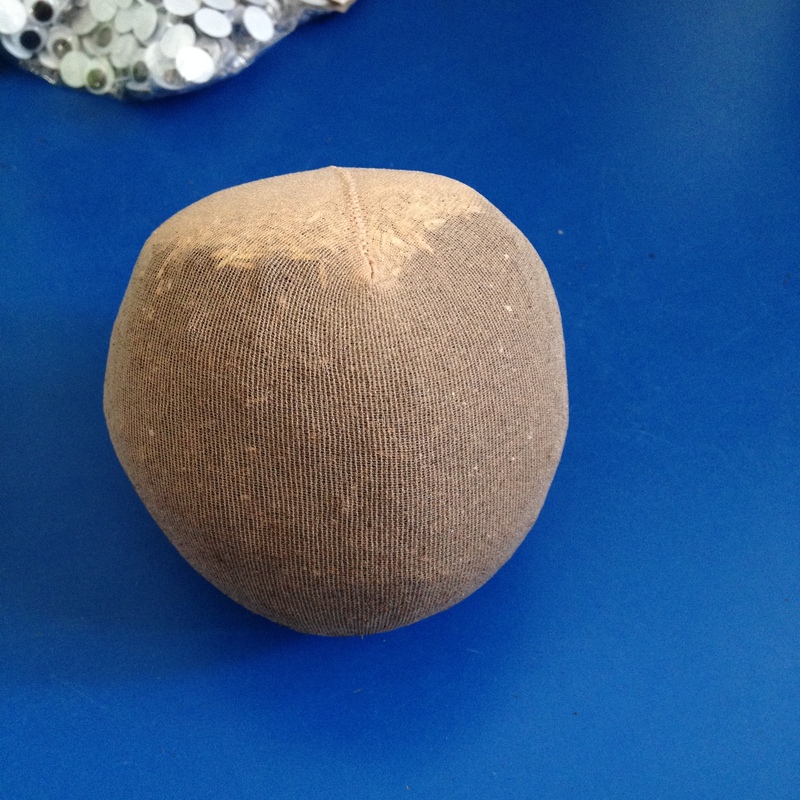 What was uncovered by the lower shore line? Did the ice do anything funny this year? And then I find out there were ICE BERGS on the National Sea Shore?! And I missed it? COME ON! 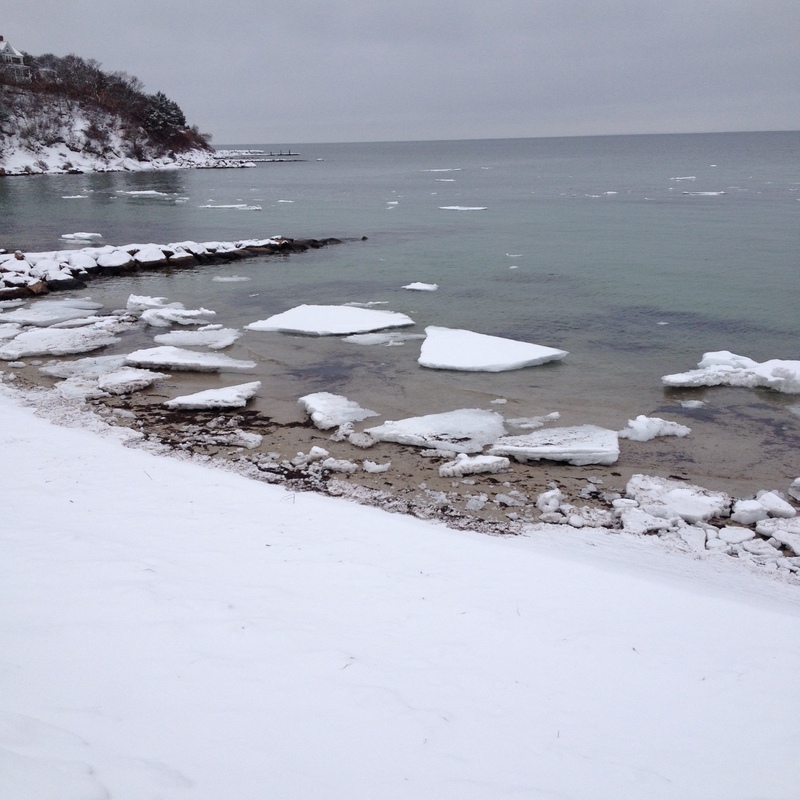 I was visiting home (Massachusetts) over the weekend and on the way to getting breakfast with some friends, we decided to stop at Old Silver Beach and see if there were any ice begs to be seen. There were not. But there were some considerably sized ice chunks floating around and a fresh coat of snow to make it beautiful. The tide was unusually high, almost up to the stairs! Can you even imagine umbrellas and towels instead of snow littering the ground? Or scores of children splashing in the water? Was it disappointing? Not at all. 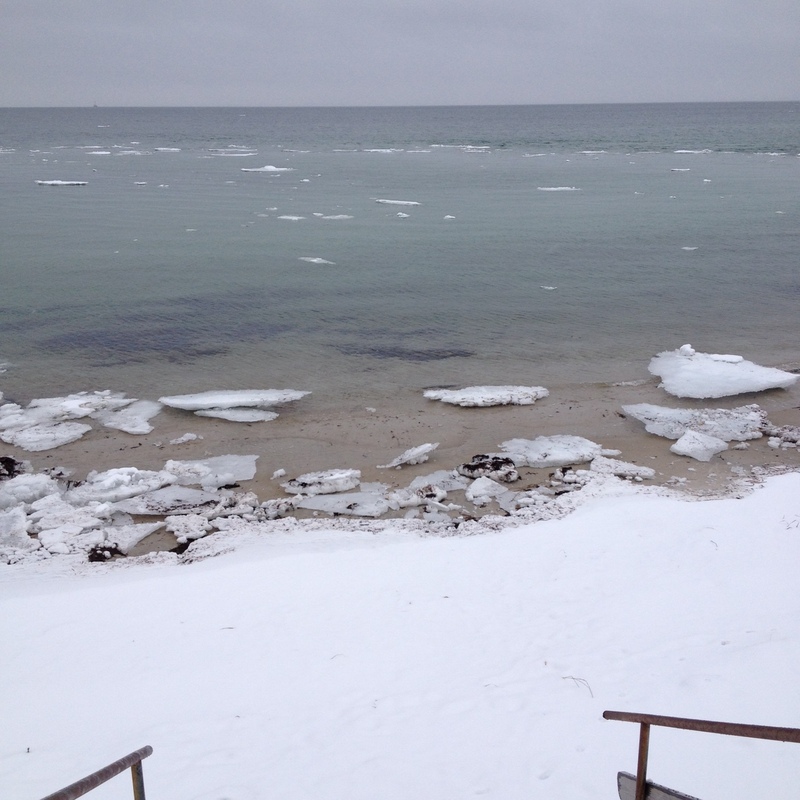 I wish I could have walked among the ice bergs, but just breathing the ocean air was amazing.